I've been super busy with beading since I last posted as I participated in two craft fairs! In my last post I had picked up some buttons for a cuff I was working on. And since then I started working on some holiday peyote cuffs, from some patterns I picked up through Bead & Button. They are so super holiday-ish! The "Christmas Sweater" cuff called for some sweater buttons. So naturally, I took another trip to the fabric store, and naturally picked up more buttons than I went in for! The black buttons on the end there inspired me to create yet another cuff of the "Boho Scroll Pattern"! Now I have three! lol! So basically every spare moment I've had in the last few weeks has been beading to stock up on product for the craft fairs. The first one was so-so, but the second one was huge and very well attended! In the meanwhile, I also did a custom set of jewelry for a friend. One day she commented on a pendant I was wearing that I made YEARS ago! It was from LaBellaJoya's tutorial, "Carnaval Pendant". I purchased that tutorial years ago and was shocked to find the printed version in my files! But I went ahead and made a few pieces with the "Carnaval" pendant as the focal. It's a fairly easy pendant to work up and Marcie's instructions are excellent! Turns out she is allergic to metal. So I used leather for the necklace and sewed on some beaded clasps. These just screamed fall and that was perfect for her dress and the fall wedding she was attending! 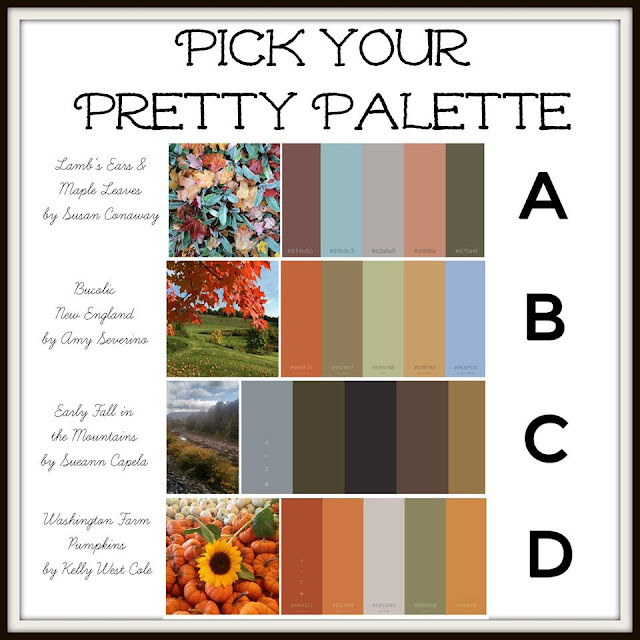 And speaking of fall - thank you so much to all the folks who voted for my palette during the Halcraft color palette challenge! It was a close race, and that is understandable, just look at how pretty these pics and palette are! Halcraft was very kind to send me a stash for participating! I look forward to playing around with the fun strands! Other than all the beading, I've mostly been working! Which I enjoy so for that I am super lucky. Have you ever seen Lucie Fink on Refinery 29? I'm totally obsessed with her "Try Living with Lucie" series. I really enjoy seeing her work and I think she is an admirable young lady! She is a stop motion video producer and seeing her work inspired me to give it a try. If you go to my Instagram (link on the right sidebar), you will see some beady ones I did. But I also brought the stop-motion fun into my day job for some gift card promotions for the holiday season. Here is a round up of the videos! I had a blast doing them! IT's super time-consuming, but I really think the result is worth it! And finally - one of my bosses teased me last month about achieving a rite of passage at my company. That rite of passage is wrangling an escaped cow back into pasture! I stumbled along this fella enjoying some of the greens outside his enclosure! I can't say I actually wrangled him....but I successfully spooked him back through the fence! But in any case I'll take credit for the wrangling! hahah! I don't think he was too happy with me! Now, it is time to brace for a small New England storm about to fall on us this evening! Happy December y'all! The cow wrangling cracked me up! What an image ~ but now you know you belong there :-D The stop motion videos are so darn cool! You did a great job on them! I absolutely love Love LOVE the set you made for your friend ~ the colors/beads/style are perfect! And the black bracelet too ~ LOVE that one! Great news on the one show that went well. Wishing you a wonderful holiday season!